Made Of CNC-Machined Aluminum For Optimal Precision And Durability Etch Buddy is a state-of-the-art tool that you use to fold, bend and shape photo-etched flat parts into 3-dimensional objects with unparalleled precision and efficiency. To use, lock your photo-etched part under one of the fingers on the top plate. Slide the supplied blade under the part and into the precision-machined fold line on the bottom plate. Then, lift the blade to bend the part to the desired shape. 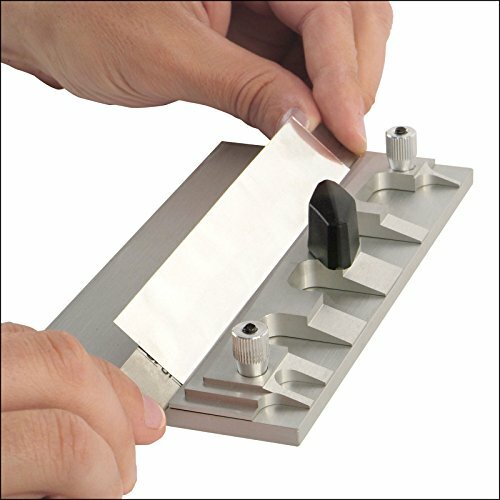 Etch Buddy has a wide assortment of finger widths and contours to accommodate all shapes and sizes of photo-etch sheet up to 6-1/2 inches long. The top plate may be rotated 180 degrees for long, straight bends. Unique features ensure perfectly square bends every time. Beautifully made of CNC-machined aluminum for a lifetime of use. Unique features ensure perfectly square bends every time. Beautifully made of CNC-machined aluminum for a lifetime of use. Etch Buddy is a state-of-the-art tool that you use to fold, bend and shape photo-etched flat parts into 3-dimensional objects with unparalleled precision and efficiency. If you have any questions about this product by Micro-Mark, contact us by completing and submitting the form below. If you are looking for a specif part number, please include it with your message.